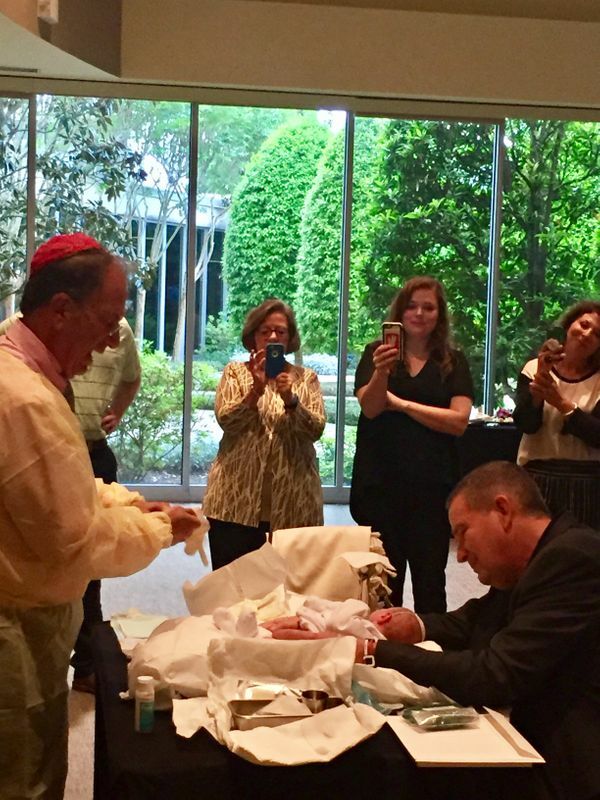 A Bris is a Jewish naming ceremony for a male infant. He undergoes a Covenantal circumcision as a sign of his entry into the Jewish people. In modern Hebrew "Brit" is the pronunciation for the older European term, "Bris". This ceremony includes both the circumcision of the infant as well as giving the infant his Hebrew name. In the Book of Genesis, God makes a Covenant with Abraham that He will take him and his descendants to be His people in return for Abraham's agreement to recognize Him as the One God and to follow His laws and precepts. Abraham signified his agreement by signing it in his flesh with the Act of Covenantal Circumcision. In accordance with God's instruction, Abraham also circumcised his son, Isaac, at eight days of age when he was born one year later. All Jewish parents, are commanded to bring their sons into the Covenant by performing a Brit Milah - Covenantal Circumcision. Since most fathers are not trained to perform this procedure, it may be delegated to a Mohel. You will need to have a table at least three to four feet in length. A pillow will be placed on the table on which the infant will lay. Prior to the procedure, the family will designate a Sandak - an individual who is honored to hold the infant on the pillow while the Mohel performs the circumcision. A cup of Kosher wine is necessary to begin the blessings immediately after the circumcision, at which time the baby's Hebrew name will be bestowed on him. A Challah is customary. For aftercare you will need a jar of vaseline, and a box of 4x4 gauze pads. Dr. Gottesman will provide you with written and verbal instructions for care after the circumcision. Dr. Gottesman will administer a local anesthetic injection approximately five to seven minutes before the ceremony begins. The actual convenantal circumcision will take less than five minutes to perform. If a Bris is postponed for medical reasons beyond the eighth day, it may not be performed on the child until he is fully recovered. Medical considerations may include prematurity, low birth weight, jaundice, or other conditions as determined by the Mohel or the baby's physician. While a Bris may not be performed before the eighth day, it is still valid if performed beyond the eighth day. Occasionally, a Bris is postponed to beyond the eighth day if a Mohel is unavailable. If a Bris is postponed, the Hebrew name will be given to the baby when the bris actually takes place. Does our son have to have a Bris? For over thirty-five hundred years, Jews have honored the sacred command given to Abraham to covenantally circumcise their male offspring. It is anticipated that fulfillment of this commandment marks the beginning of a life of commitment to Jewish ideals by the young infant. A circumcision performed before the 8th day, is simply that, a circumcision. It is not a Bris. Giving a child a name is an important responsibility for all parents. In the United States, often-but not always- the child may receive a name in English that does not have a direct Hebrew equivalent. Frequently, the Hebrew name that is chosen is selected to honor a loved one who has passed. Your Rabbi can act as a guide in helping to select your baby's name. Dr. Gottesman is also available to provide suggestions if you need. Being that the actual mitzvah of Brit Milah is incumbent upon the father, it is, therefore, customary that the father should stand near the Mohel and to verbally appoint him to act in his behalf in performing the bris. A Bris should be performed during daylight hours prior to sundown.